ROSEAU, Dominica — The Discover Dominica Authority (DDA), producers of the annual World Creole Music Festival, announced the line-up for this year’s festival at the official launch on June 25, 2014, under the theme ‘Creole Runs the Night’. 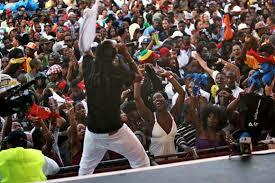 The festival is scheduled for Friday 24th to Sunday 26th October at the Windsor Park Stadium, Roseau, Dominica. Headline acts on the 18th edition of the Festival include Jamaican dancehall artiste Jah Cure; Afro-beat sensation Flavor of Nigeria, West Africa and Latin Grammy Award-winning Merengue singer Elvis Crespo of Puerto Rico. This formidable line-up of Creole musical acts will create the much anticipated festival excitement. Coupled with a stunning array of Zouk masters hailing from Guadeloupe and Martinique inclusive of the well-known ‘Franky Vincent’ and Harry Soundourayen, ‘plus Haiti’s masters of Compas – Tabou Combo with over 50 years in the business, Brothers Roberto and Reynaldo leading T-Vice and ‘newly formed but creating waves Klass with Pipo on the lead vocals; and from the Soca Arena –Bachanalist Kerwin Dubois, Wining Queen Denise Belfon, and Destra are sure to present that Trinidad blend of Creole. Dominican artistes will spice up the three nights of Pulsating Rhythms. The Triple Kay Global band as they are popularly known will display bouyon rhythms in their customary authentic style. The Xtasy Band hailing from the south of the island will make their debut on the World Creole music festival stage. The legendary Midnight Groovers will provide the unique Dominican ingredient of Cadence-lypso into the line-up recipe. The Midnight Groovers band, who provide that Dominican essence, will be the “Honored Creole Icon” for this year’s festival. Patrons over the next few weeks can look forward to more artistes being added to the lineup and promotion on tickets for the World Creole Music Festival. The Dwivés will be on once again as part of the fringe events and will feature a number of young upcoming Dominican talents.